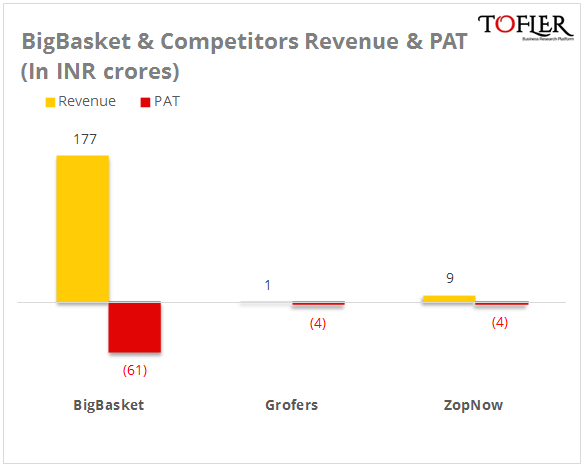 Hyperlocal grocery delivery startup BigBasket saw a 2.5 times growth in its revenue in FY 14-15 as its revenue figures reached INR 178 crores. BigBasket, which is owned and operated by Supermarket Grocery Supplies Private Limited, was founded by Hari Menon, V.S. Sudhakar, Vipul Parekh and Abhinay Choudhari in October 2011. It is an online grocery store that operates through the website and mobile app and provides home delivery in on-time and flexible delivery time slots. BigBasket is currently present across 15 cities in India. The company claims to have more than 18,000 products in numerous categories including grocery & staples, fruits and vegetables, beverages, branded foods, personal care, household among others. 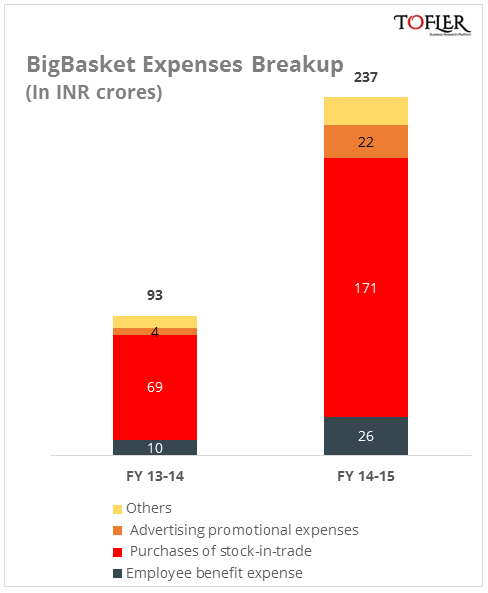 BigBasket reported revenue of INR 178 crores against loss of INR 61 crores in FY 14-15. 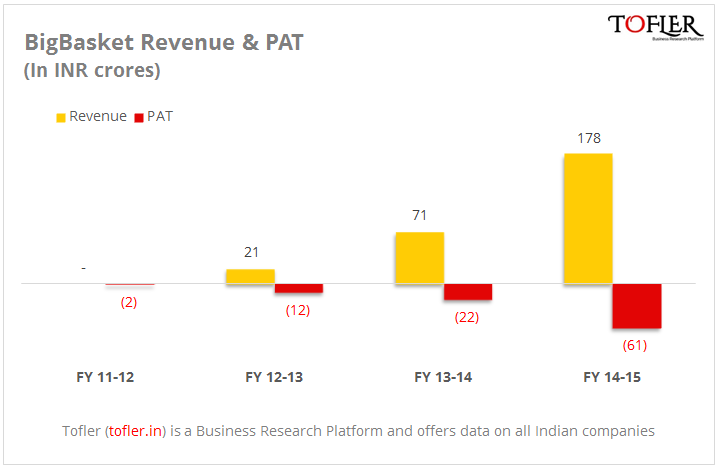 The revenue and PAT figures during the last fiscal were INR 71 crores and INR 22 crores, respectively. 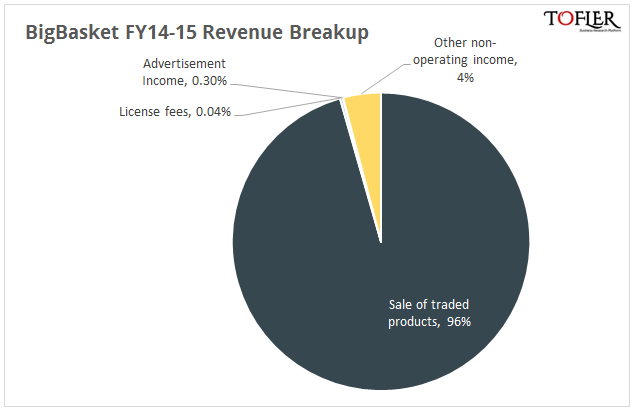 The revenue from operations stood at INR 170 crores in FY 14-15. 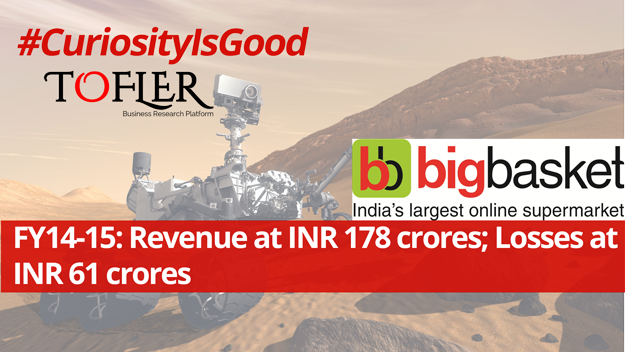 As per the documents filed with the Registrar of Companies, the company has raised a total funds of INR 695 crores from various investors including Bessemer Ventures, Helion Partners and Sands Capital. The latest investment of INR 124 crores was done by the US based Sands Capital. It is worth noting that most of the other players are in their early stages and have been operational for 4 years or less. The online grocery store segment has seen a lot of action in the past one year. Grofers recently raised $120 million from Japan’s SoftBank in November 2015. However, it shut down operations in 9 tier-2 cities in January this year as it did not deem the market ready. Another player LocalBanya shut shop in 2015. The space has also attracted E-commerce giants like Flipkart, which has launched Flipkart Nearby; Amazon that launched Amazon KiranaNow; Snapdeal invested in Peppertap in September last year. Godrej also launched Nature’s Basket to compete in the segment. Ola Cabs has also come up with Ola Store for hyperlocal grocery delivery. The well-funded companies have been on an acquisition spree. Grofers has acquired rival MyGreenBox in April last year along with acqui-hiring Tech companies SpoonJoy and Townrush. BigBasket acquired hyperlocal delivery Delyver in June, 2015. PepperTap also acquired Bangalore based hyperlocal grocery delivery startup Jiffstore. Among acquisition, closures and big entrants, it will be interesting to see how the hyperlocal grocery market evolves in the coming year.